Vasa previa is a rarely (1:3000) reported condition in which one or more fetal blood vessels from the placenta or umbilical cord cross the entrance to the birth canal, beneath the baby and just close to the inside of the cervix. The condition has a high fetal mortality rate (50-95%). 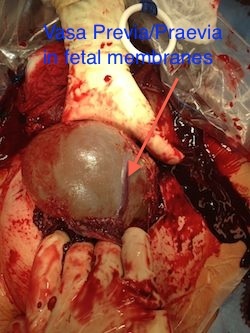 This can be attributed to rapid fetal exsanguination resulting from the vessels tearing when the cervix dilates, membranes rupture or if the vessels become pinched off as they are compressed between the baby and the walls of the birth canal.